The organizers of the current edition of the festival are: Bistrita Trade Union House of Culture, with the support of: Bistrita City Hall (Local Council), Bistrita Palace of Culture, National Association of Culture House of Unions in Romania.. 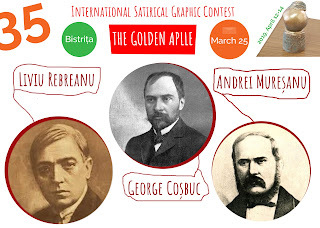 The 35th International Satirical Graphic Contest The Golden Apple 2019, Bistrita, Romania.. The organizers of the current edition of the festival are: Bistrita Trade Union House of Culture, with the support of: Bistrita City Hall (Local Council), Bistrita Palace of Culture, National Association of Culture House of Unions in Romania, Romanian Epigrams Association, Bistrita Pomicol Resort and Bistritan Humor Association.. 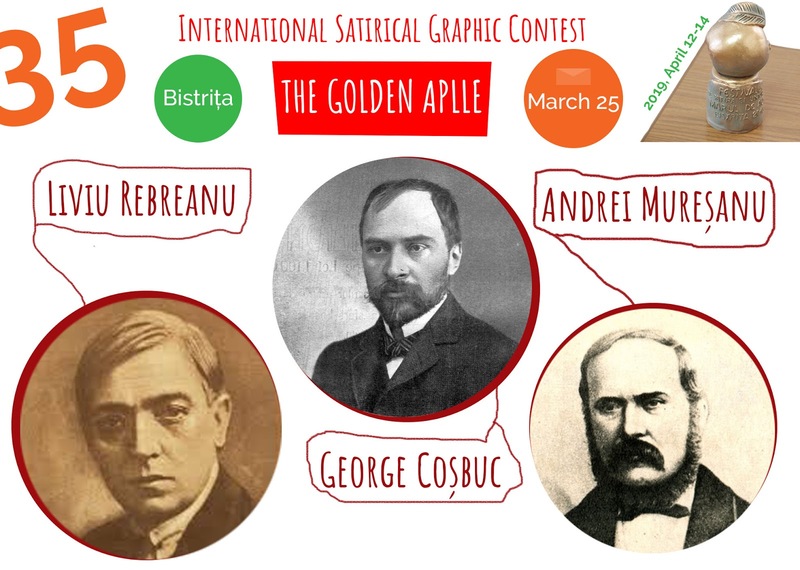 The XXXV-th International Satirical Graphic Contest „Golden Aplle” – Bistrita, takes place on April 12 – 14, 2019 and it is addressed to all cartoonists around the world. Up to 5 works per theme can be submitted. 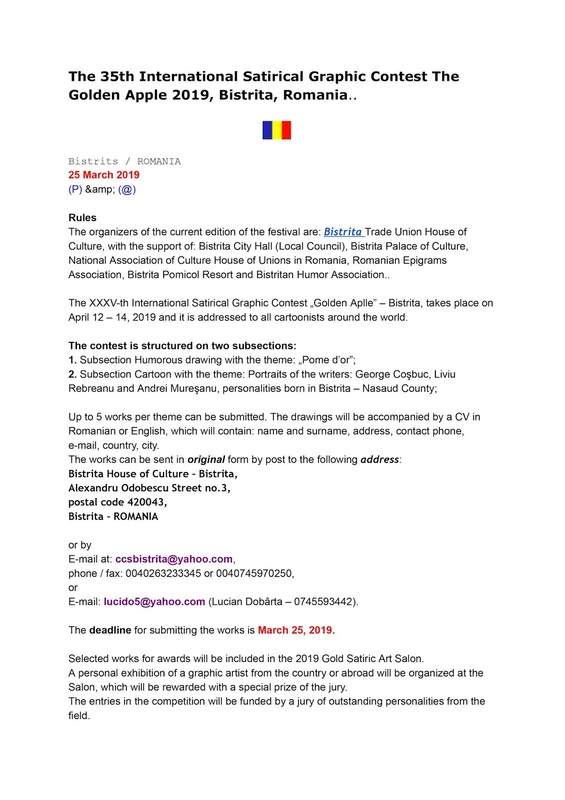 The drawings will be accompanied by a CV in Romanian or English, which will contain: name and surname, address, contact phone, e-mail, country, city. 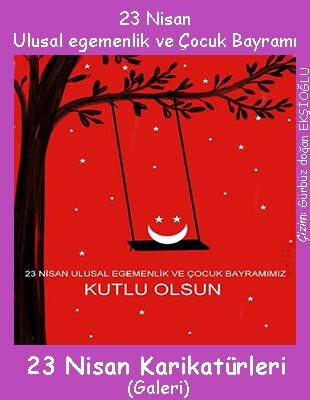 E-mail: lucido5@yahoo.com (Lucian Dobârta – 0745593442). The deadline for submitting the works is March 25, 2019. Selected works for awards will be included in the 2019 Gold Satiric Art Salon. A personal exhibition of a graphic artist from the country or abroad will be organized at the Salon, which will be rewarded with a special prize of the jury. The entries in the competition will be funded by a jury of outstanding personalities from the field.